^^^^ he's right, you cannot spend too much time in your shed! 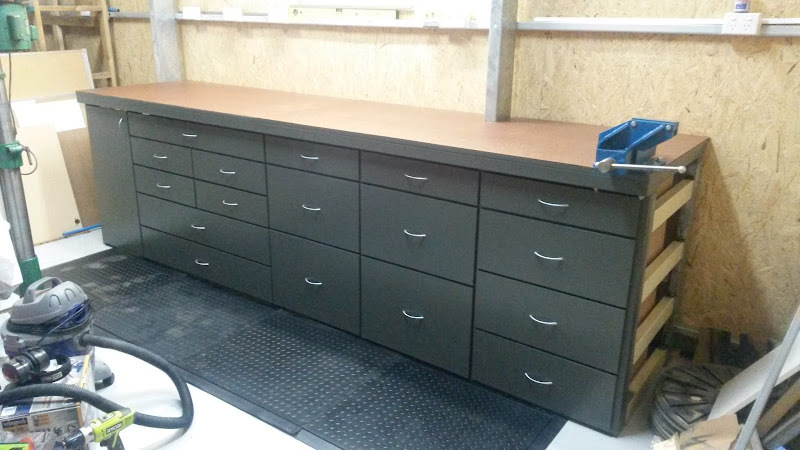 It's an ALL STEEL frame weighing in at ~120kg for just the frame and 200kg+ with all drawers and tools stored. 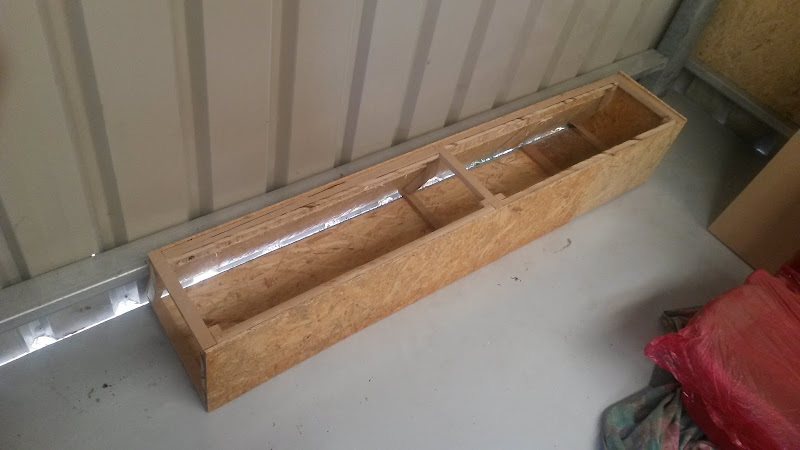 It's made from second hand 76x38mm patio tube with a 150x50mm tube as the front so I could have a 50mm overlap for clamping items to the bench if needed. Overall dimensions are 3.4m long x 0.8m deep. It's screwed to the two steel columns by only 4 Tek screws but the whole bench does not move at all. 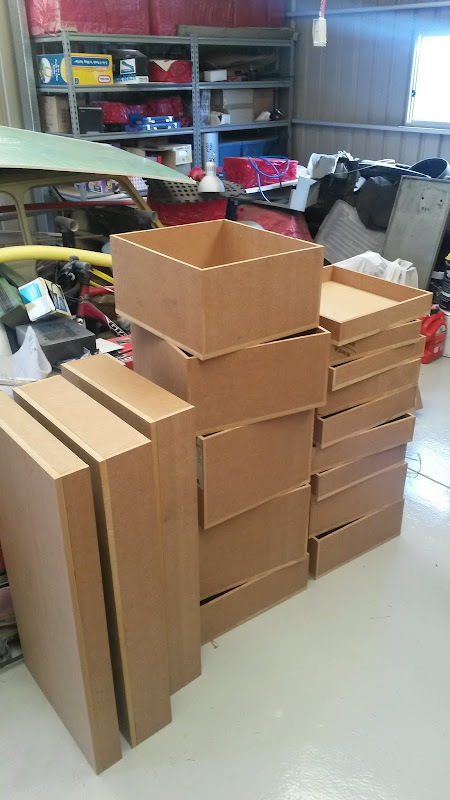 The drawer boxes were made also from second hand MDF I sourced from a cabinet maker from their cover sheets. 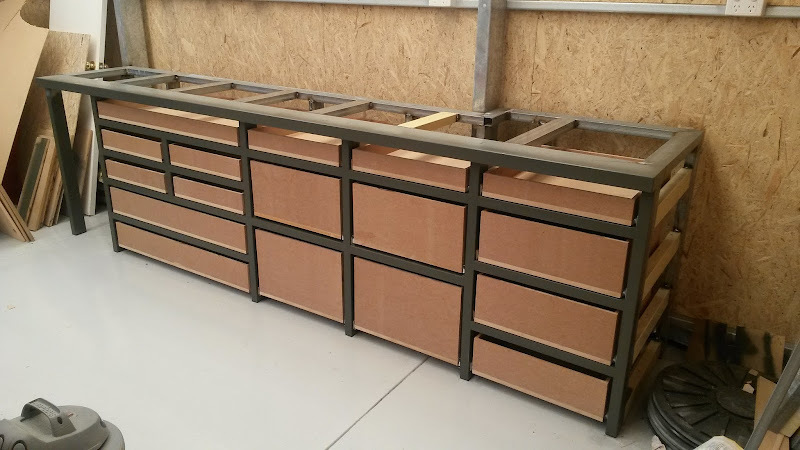 All drawer bases are 18mm MDF while the sides and fronts are 12mm MDF. 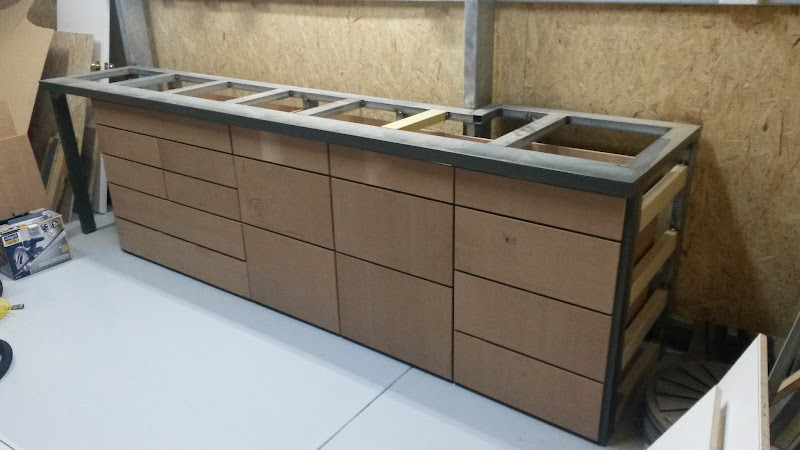 The benchtop is made from 18mm MDF (screwed to the steel frame) with a layer of 3mm masonite over the top. 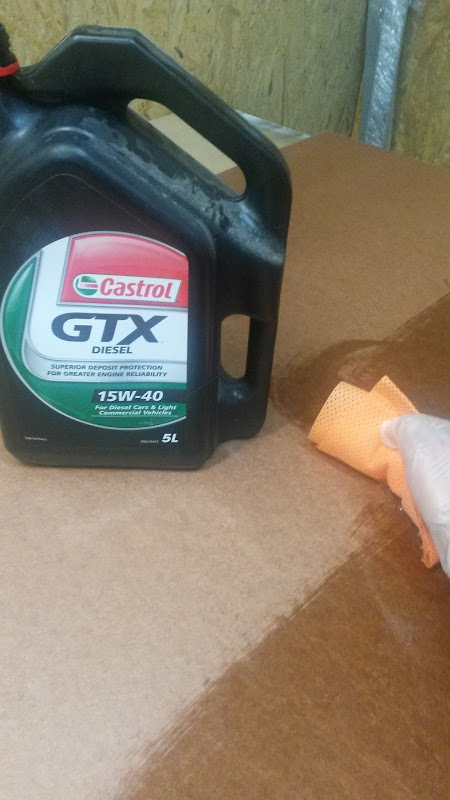 I also oiled the masonite which involves pouring and wiping any kind of engine oil over the board, let it soak it in (I used about 1 litre in the whole area!) and wipe off any excess. 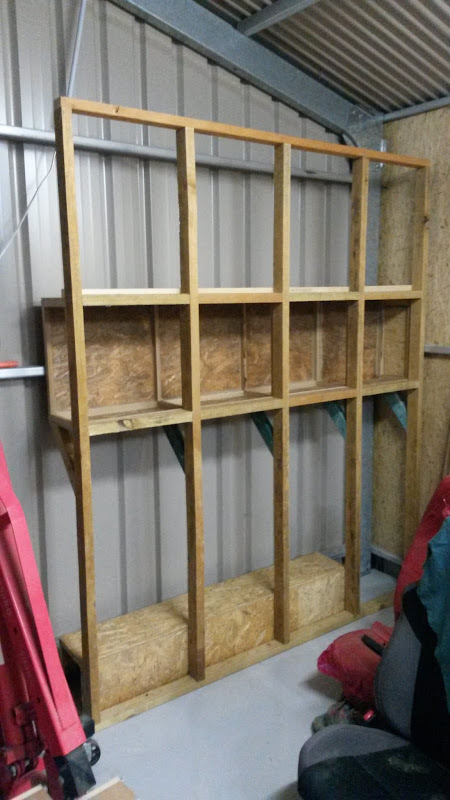 Finally, paint the frame and drawer front lot in enamel paint and then figure out where all my tools will be stored - which will probably evolve as I start using the garage a lot more. Saw the first pic without reading wondering how you manages to weld timber to metal XD. then realised it was probably downpipe. It's not downpipe - that's far too thin. It's standard patio frame tube which is 1.5mm thick, some was cream colour and the rest was bare galvanised. 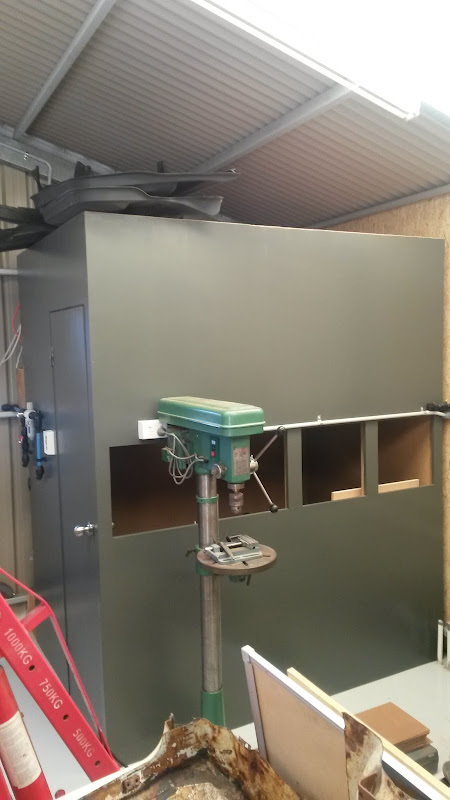 I have also (mostly) finished the paint booth. It's not something I will use frequently however I have more than enough room in my garage for it and it's very useful when I do use it, not to mention preventing any overspray on everything else in the garage. I did all the proper calculations to size the filter areas and fan size, as the booth I had at my old house always had an issue with not enough air flow. 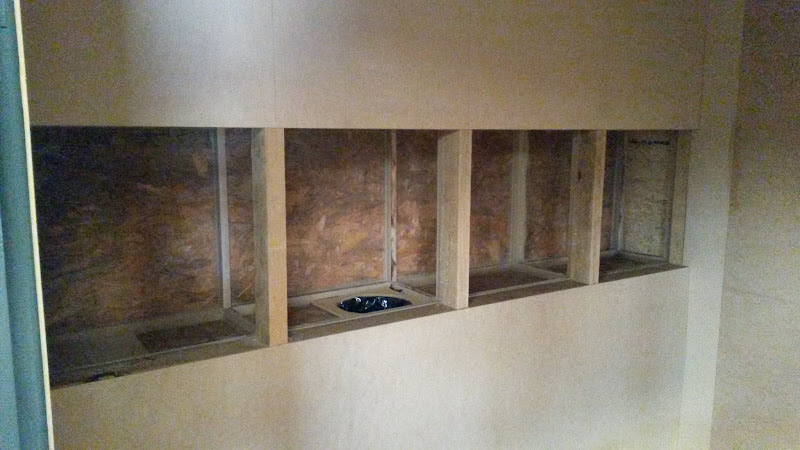 The booth is a cross-draft design with four filters across the width of the whole booth. This is the interior (note I have not built the bench inside yet) showing the exhaust manifold and the 200mm duct opening leading to the fan. On the exterior, I have some compressed air fittings. 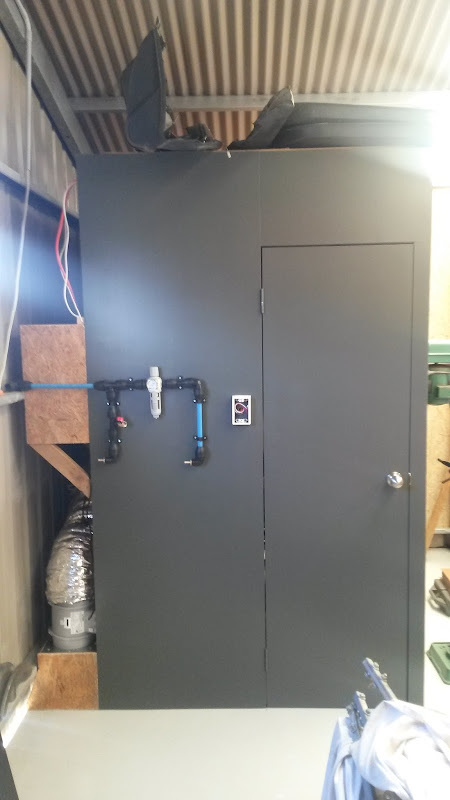 The compressor will be located inside the booth with an flexible air line running from the compressor to the RHS of these fittings. Air will travel through the filter/regulator and then either travel down the LHS of the fittings back into the pant booth (for paint gun), or out to the air lines that run around the perimeter of the entire workshop. The switch next to the door will be for turning on the interior light, fan & compressor without having to enter the booth. I also have a small ball valve (red handle) in these fittings to purge the system of air when I've turned the compressor off. The fan on the left is a 635CFM/474CFM (high speed/low speed) axial fan. Noice although I am a fan of Adam savages "put everything on wheels"
A paint booth on wheels? 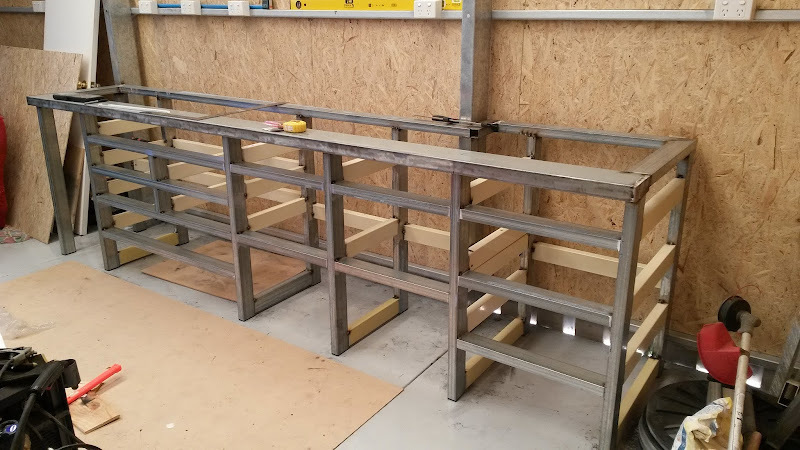 The bigger fabrication items for my workshop are almost done and the last one is for my metal lathe. I bought this over a year and a half ago and it was drowned in lanolin oil to prevent any surface rust forming on the machined surfaces and has been sitting under a sheet since then. The bench that came with it was far too short and I didn't want to be stooping over it while working so a custom one was made. 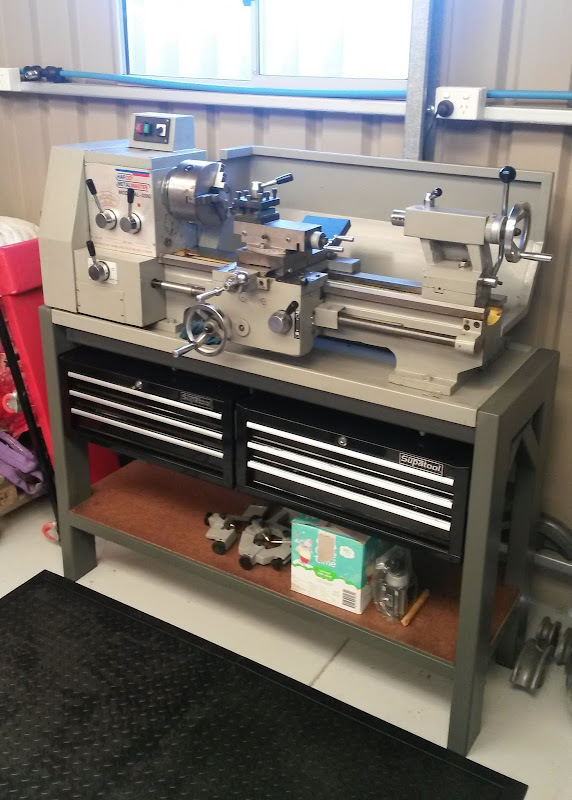 The bench had to be high enough for me, some space for some 3 drawer toolboxes I bought, a shelf for spare chuck/steadies etc and enough room underneath for the engine crane legs while installing the lathe. 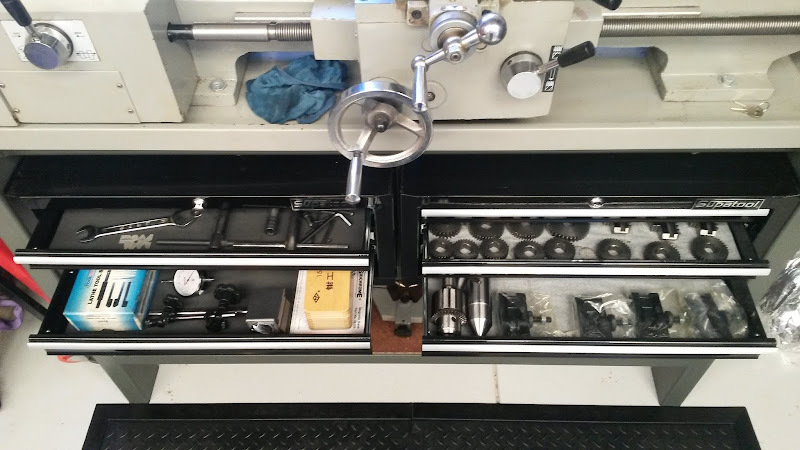 The main feature of the bench is the massive 200x100x5mm beam that the lathe bolts to. This is a spanning/torsional beam and it locates the lathe accurately and prevents any flex. The end steel 100x50x3mm with the lower shelf just standard 76x38 patio tube left over from my workbench. 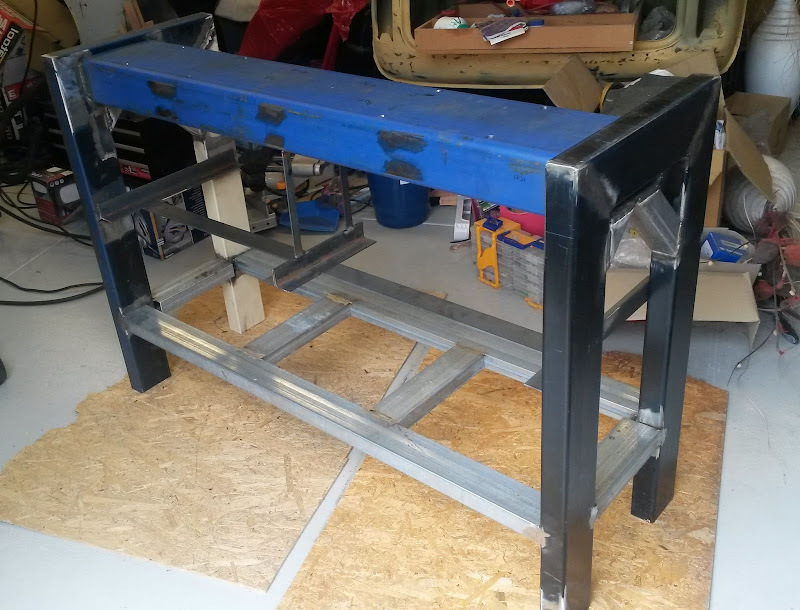 The bench (1320W x 890H x 450D) was easy to fabricate and painted the same colour as my workbench & paint booth. The lathe was lifted in place, bolted down and then I spent a couple of hours cleaning the lanolin off everything, wiping everything over with oil (standard motor oil), replacing the headstock/gearbox oil, oiling the ball oilers. 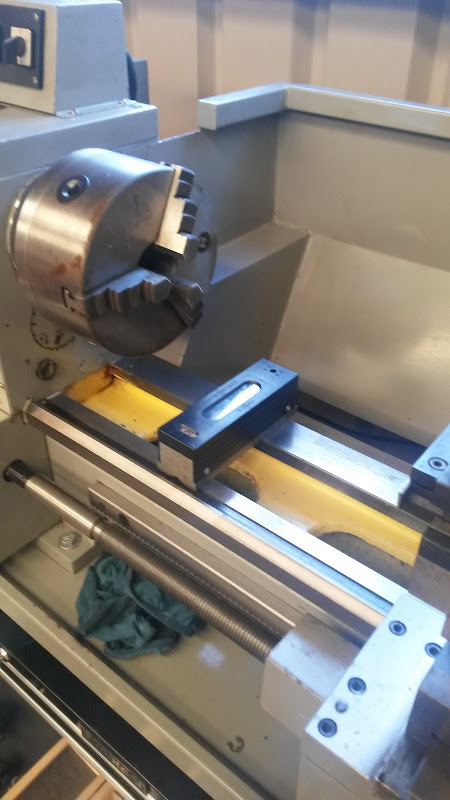 I had a precision engineers level which provides a ridiculously high accuracy of 0.02mm/metre and set the levels so there was no twist in the lathe bed. I got the twist to within ~0.03mm across the width of the lathe. Love your work , looks so professional , wish i had those skills .